Have you ever dreamt of wandering through the colours and fragrance of million gorgeous flowers? then Keukenhof is the perfect place for you, your dreams can come true here! With more than seven million tulips, daffodils and hyacinths stunningly spread across 32 hectares of park area and fountains, Keukenhof is the most beautiful spring garden in the world. 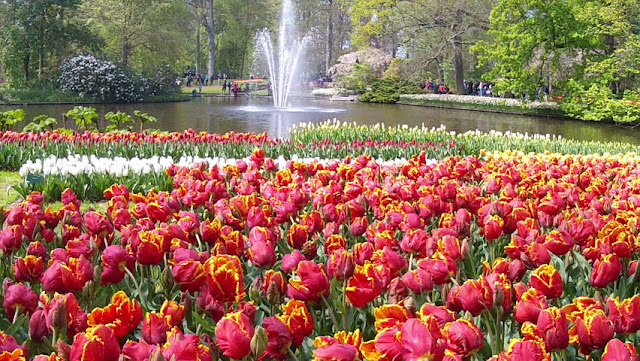 Located just about 20minutes away from the Schiphol International Airport, Keukenhof makes one of the most favourite day trip attractions from Amsterdam. The garden also features 30 different flower shows and hundreds of aartworks– with unique themes every year. Sounds Interesting? Keep reading then..., Here’s all you need to know about the magical garden. The whole Keukenhof garden and fields outside (about 80 hectares) used to be a domesticated forest, from where the “castle of Jacoba van Beieren” collected herbs and vegetables for their kitchen. After the death of Jacoba van Beieren, the whole landscape was designed into a beautiful park around his castle, that made the base for today’s Keukenhof gardens. The Dutch word “Keukenhof” refers to the history of the park as a “kitchen garden” (“keuken” means kitchen, and “hof” is translated to a sort of a courtyard garden). Do you wonder how to pronounce the word Keukenhof? You don’t want to want to know how I used to pronounce (massacre!) in the beginning days and confuse others. Now, my understanding/pronunciation is much better and probably can suggest you try “ko-ken-hof” with hof sounding like “off”. That’s not exactly the right pronunciation, but that’s the best I can describe, and people will definitely understand what you mean. Ok, I’ll end the Dutch and history lessons here😊 and move on to how to get there. 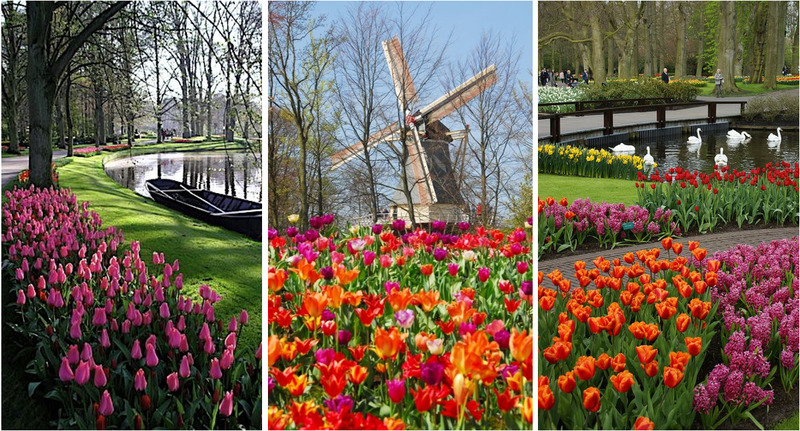 Keukenhof is situated between Amsterdam and Den Hague (The Hague) in a town called "Lisse". It is easily accessible by car and well connected by public transport from both Amsterdam and The Hague. By Car: Follow the clearly marked signs to Keukenhof from the highway, or just set your GPS to Stationsweg 166a , 2161 AM Lisse. Look for the sign of “P-Extra”, It’s huge parking area, you can leave your car for about €6 per day. Please note that the parking will be closed within one hour after the Keukenhof park is closed. Don’t miss the timing, otherwise, you’ve to wait until the next day to pick-up your car!. By Public Transport: If you are starting from Amsterdam or north part of the Netherlands, there is a direct bus from Amsterdam Schiphol Airport (bus route# 858) – which will be approximately 20mins travel. If you’re coming from South or by train, then Leiden Central is the nearest train station, from which you have a direct bus (route# 854) to Keukenhof – that will also be the same 20 mins travel. 👉 Note: If you're planning on public transport, you may look at the “Combi-ticket”, which includes the roundtrip bus from Leiden/ Schiphol combined with the entrance to Keukenhof. The ticket is usually €25 for adults and €12.50 for children 4-11 years old. You can buy them online from the Keukenhof website. By Bike: If you’re feeling strong enough! !, you may bike all the way to Keukenhof in an hour. There’s a beautiful biking route from Schiphol, about 19 Kilometers long. Keukenhof Garden and the tulips fields are available only during the “spring” period, from end-March to mid-May. (This year, it’s open from 21 March 2019 - 19 May 2019). There will be beautiful flowers throughout this period, but so far what I have seen in the last few years, the best time to visit the park is: "2nd/3rd week of the April" – this is the time when all the bulbs will be in full bloom and tender fresh. Keukenhof garden is open all days (in spring) from 08:00 – 19:30 hours, but I would STRONGLY advise you to avoid weekends and public holidays; there will be a huge crowd on holidays. Always buy tickets online so that you can skip the long lines and visit on a weekday and as early as you could make it in the morning. Probably, you don’t need anything more than those stunning 7 million flowers and gorgeous garden. But, your kids may ask more and Keukenhof has something for them too. ⇨ There is a treasure hunt for the children, a petting farm, a maze, and a playground. ⇨ There are various exhibitions and flower shows with demonstrations that can keep the kids more engaged. ⇨ You can also take a boat trip through the beautiful flower bulb landscape. ⇨ This is something you must try; you can rent the bikes from the entrance and go all over the beautiful fields around. You’re free to walk around and take pictures, but don’t walk on the grass. Most of the visitors are not aware of it (or pretend), but it’s strictly forbidden, you might face some serious yelling from the housekeepers. It’s a huge park so you may plan to bring your bike/kick scooter, but please be aware: they are restricted as well. They might stop you at the entrance itself. Finally say: If you like flowers and beautiful gardens more and won’t mind the crowds, then yes, Keukenhof is sure for you. You'll like in a paradise. 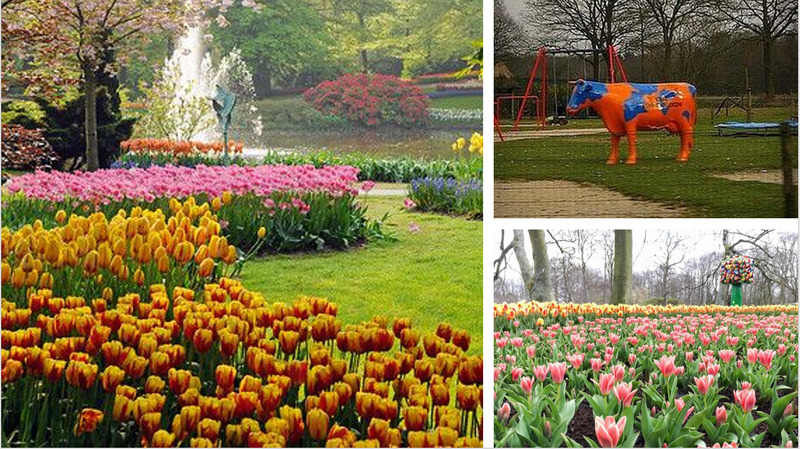 If you like flowers & nature but cannot bear the crowds, then you should plan to be there really really early; or alternatively, you can skip the Keukenhof park and explore the beautiful tulip fields around. Photo Disclaimer: Some of the pictures above are not taken by me. As far as I verified (with different copyright tools), they are "free-to-use". If you still find any discrepancies please let me know. Europe has one of the best-connected rail-networks in the world; almost every part of the continent can be reached via trains. Europe train trips are often picturesque - railing through beautiful landscapes and conveniently bring you to the heart of the city (unlike airports which are usually miles away from the city center). Train travels are also one of the most peaceful, relaxed and cost-effective ways to travel. However, there are a few key essentials that you need to take attention - for getting the most out of your European rail journey. Here are 10 tips to help you plan and enjoy a seamless trip. Unplanned, On-the-Go plans are always handy; there’s no match for the flexibility and creative spontaneous changes you can accommodate. But remember, they are not always comfortable nor economic! Especially during the summer months, you’ll lose a lot of time and money if you bang on on-the-go tickets at stations. I would advise you to buy the tickets always in advance. Usually, you can book the tickets 60 days in advance (some Eurostar tickets can be purchased even 4 months in advance). There can be a considerable saving too if you buy them earlier. For example, a normal one-way ticket from Amsterdam to Paris is usually around $45. But the same can cost $100 a few days before the travel and can go crazy upto $175 on the same day of travel, during peak periods! Point-to-point train tickets are ideal for single journeys and travelers who have a pre-planned fixed-itinerary trip around Europe. On the other hand, If you intend to clock up a fair long mileage and (crucially) want to stay completely flexible, then a rail pass is most likely the best choice for you. There are several types of European rail passes to choose from (link here). The right rail pass for you depends on the number of countries you want to see. There are different varieties of passes: based on your total duration of travel, whether you’re a European resident or not, age (youth discount, senior concession) …etc. ☝You must also consider that there can be an extra “reservation charges” even if you have the rail passes. Particularly, every intercity train from/to France, Italy or Spain mandates the passholders must also pay a reservation fee in addition to buying the passes. Heard that Paris-Amsterdam intercity too requires an additional fee. So, consider all these facts while deciding whether to buy a Rail Pass or get tickets to the station on the flow. Many train tickets need to be validated (more like a check-in) before entering the train. There are machines at the station where you just show/insert your ticket. Some machines may print the date/time on the ticket, some just register your details into the system. You should always check whether the validating procedure is required for your ticket (this is mostly depending on which country you’re traveling; heard that Italy is very strict on this). That's because most regional tickets can be used any time in the 60 days from the date you bought it for, and date-stamping it on the validating machines prevents people fraudulently using it on multiple occasions. If you’re found traveling without validating the ticket, you have chances of receiving “huge” penalty in addition to the plenty of emotional agonies you’ll go through😞. By chance, if you miss to check-in and board the ticket, you should immediately meet the ticket checker and inform. He can do it with his checking machine or will advise you to check-in in the next station. But don’t wait till he comes to you and checks the ticket. Changing trains/ platforms may sound like the simplest thing, but that’s not the case everywhere. There are many mega-stations with 50+ platforms within Europe, you may be surprised to know that the platform your next train is leaving from is quite a walk or run (depending on how much time you have😜). Another tricky thing to consider is the "location" where the platform numbers and train schedules are published. Usually, they’ll be displayed everywhere in big stations; but in many small/medium stations, these “magic” boards will be available only at the station entrance. So, you’ll have to make a quick walk/run to the entrance.If you’re on a bit of bad luck, you may encounter “last minute” platform changes too. It is always better to accommodate at least 30mins for the platform changes/transfers. Many European countries require you to carry official I.D. with you while traveling, and a driver's license from another country doesn't count!😜This means that, even though you're unlikely to be checked, you must have your passport with you always and may have to show it to the train conductor when asked. I must also stress another fact here: carrying your passport everywhere with you increases the odds of losing it or having it stolen (this happens a lot in metro cities). Many people prefer to keep the passport and other valuables locked in a hotel safe. But when you’re caught by the train conductor/customs, you must be ready to convince them to go and get it from the hotel. Call me crazy, but I can’t stop my craze for the window seats. Most of the rail routes in Europe are so picturesque; just sitting in the carriage and looking out the window may be one of the best things to do. The trains will treat you to beautiful mountains scenery and sparkling lakes, as they pass you by from the comfort of your seat. There’s no baggage weight limit for most of the trains, you can bring as many carry-on bags as you can place underneath your seat or in the baggage rack above. But I would still say “the lighter your bags are, the happier you’ll be”. Not all the station platforms are equipped with lifts and baggage carts, your big bags may turn as a pain to move around fast and comfortable. You don't want to miss a connection train just because you couldn't transfer your luggage!. If you’re traveling long distances, the night train can be useful. It’s a unique experience, not saves a lot of money all the times ( In fact, some night trains charge you a bit of extra cost), but still, you’ll most likely save money compared to a night in a hostel/hotel😜, and very importantly you save the “day” time - which is precious for sightseeing and other activities. Long distance trains often have restaurants or cafe cars. Medium distance trains may rely on a cart carrying sandwiches, snacks, drinks, and coffee. But most regional trains often carry no food or beverages. Best bet is to bring your preferred food before boarding the train or check out the stores at large train stations which will have a variety of options to take on the train and it'll probably be cheaper and tastier than the stuff they serve from a cart. Never rely on the onboard service, you'll have to stay hungry then. Last but not the least: the safety of you & your belongings. It doesn’t matter how wonderful your vacation was, a stolen or lost luggage can easily ruin your entire vacation experience. Unfortunately, the theft of luggage from trains is a common and increasingly ongoing problem. The more stops on your trip the more chances of theft. So always pay attention to your valuables. That brings to the end of my list and I hope they’ll be useful in your Europe train adventure! Do you have any other essential information? Please leave a comment. Now you know, why I've been silent for a while; I was completely submerged into the "Sapiens: A Brief History of Humankind" by Yuval Noah Harari. It's an excellent and extremely "heavy" (in content) book; tells the 2.5 million years-long history of humankind and explains how we - the homo sapiens evolved as a supreme class while many other species died out. The book starts with an outline that the first ever humans originated in Africa about 2.5 million years ago, while humans were a completely unremarkable creature. Neanderthals and Homo Sapiens - were just two of the multiple “human” species, who co-existed for a while. But the Homo sapiens successfully went through 3 major revolutions - Cognitive, Agricultural and Scientific revolution; which many other species could not. This made humans to dominate and become the top species on Earth. The cognitive revolution, about 70,000 years ago, offered homo sapiens the chance to spread all over the world. As every book says, the major breakthrough was the invention of “fire”. The fire enabled the sapiens to cook food and reduced the amount of energy human body needed (both to digest food and to withstand cold). This excess (saved) energy helped the brain to develop further. By then the human brain used more than 25% of body energy and grew drastically; though the brain is just 2-3% of our total body weight, it consumes >20% of our body energy, even today (can't believe, isn't it? 😉). This larger brain led him more intelligence, imagination, and very important communication. His communication skills brought in “language”. His imagination gave birth to thousands of stories, religions, and beliefs. All this combined, helped him to grow as a group (society), with a lot of interaction and collaboration between each other. We used this cognitive ability to withstand our dangers and survive better, while the other species were eliminated. About 12,000 years ago, humans reduced his efforts to move all over the places for food, instead started domesticated some plants and animals. Most of the crops/animals what we’re eating till now were domesticated during this period. Stable food at one place also led to a stable residence. Villages, towns to cities and kingdoms were formed. However, the author does not acknowledge the agricultural revolution as a "progression" that man made. In fact, he even calls it as "history's biggest fraud.". He writes as "The Agricultural Revolution certainly enlarged the sum total of food at the disposal of humankind, but the extra food did not translate into a better diet or more leisure. Rather, it translated into population explosions and pampered elites. The average farmer worked harder than the average forager, and got a worse diet in return"
He also defends his anger with a fact that an average man was roughly 5'10" tall and the woman was 5'6" before the agricultural revolution. Then sooner, within 3-4 generations, the average heights dipped to 5'5" for male and 5'1" for female. Many researches show that it was mainly because of his diet switch from more proteins to carbohydrates, combined with less physical movement. This is quite a fact, Isn’t it😞? Till the year 1500, human’s acquaintance to objective science was quite confined. Till 15th century, no human had even dreamt of circumnavigated the earth, but this changed when Magellan successfully returned to Spain in 1522. Prior the year 1500's, he just believed that the sky is only for the birds and angels. But he broke his own beliefs on 20 July 1969, by entering into the moon. During the last five centuries, humans increasingly came to believe that they could increase their capabilities by investing in scientific research. This wasn’t just blind faith – it was repeatedly proven empirically by many historical technology milestones from engineering to medicine. On the other extreme, he started pushing science and technology on war and nuclear bombs; started making strides in biotechnology by modifying the genes of vegetables and animals, with no clear boundary of what is good and what is forbidden to do. He keeps trying to change things with mortality, by cloning and Artificial Intelligence. Thus, even after becoming the primal species of the world, human still stays more than ever dissatisfied and irresponsible who don’t know what they want!. Harari ends the book talking about the future of humankind including how the world needs to come together to solve truly global problems such as global warming, and the rise of artificial intelligence. As I said, the book is a heavy read, not something you want to take along on a beach vacation😇. But if you have little interest in science and want to know how the humans evolved, you’ll absolutely love this book, it’s extremely interesting, engaging and informative. I confess it again; this riveting and myth-busting book cannot be summarized… (what I have written so far is too small) you will simply have to read the full book. You might have already booked the tickets to Amsterdam or are you planning to visit soon?. Amsterdam is incredibly attractive; be it a rich cultural, architectural, heritage tour or you’re prepping-up for the wild adventures of “coffee shops” and “Red light District”, you’ll surely enjoy your time in the beautiful city of Amsterdam. However, there are some crucial things you need to know upfront, for a more enjoyable and less strenuous visit to Amsterdam. Let me start with some good news first. You don’t need to dread about language issues at all. Dutch speaks good and fluent English. My Dutch colleagues often say that “our English is better than our Dutch😉”. Yes, it’s not a joke, many international surveys show that the Dutch are best at speaking English than any other non-native country. If you still want to impress the locals, here are a couple of basic phrases in Dutch: "Dank U" = is a polite/formal way of saying thank you and “Bedankt” or “Dank je wel” is little informal/friendly way of saying your thanks. You might hear the waiter in the restaurants/shops may say “Alsjeblieft”, which is translated as “please” or “here you go”. It doesn’t matter which season of the year you’re coming in or which tool you use to predict the weather, you can never ever predict the weather of Amsterdam. The forecasts may tell you a nice sunny day, but somehow the clouds of Amsterdam will surprise you with rain and wind. Rainfall is quite common in Amsterdam (on an average there are 217 rainy days a year!). So, it’s never a bad idea to carry your rain jacket or umbrella. Don’t lose your hopes on Amsterdam yet; you know what they say: after rain comes sunshine😊, just be prepared mentally and physically, that’s it. Amsterdam has one of the best public transport networks; trains, metros, trams, buses, and ferries all are fittingly interconnected - to help you get around the city. Taxis are expensive, but also the traffic can be crazy during the peak hours. If you’re in the city for a few days, it’s sensible to buy the public transport chip card (OV-chipkaart) - a single chip card allows you to board all the modes of transports. The most convenient option for visitors is a disposable one-hour card or day card (valid for one to seven days). They allow unlimited journeys across the whole network, throughout the duration you choose. Amsterdam is an incredibly bike-friendly city; there are designated bike lanes everywhere. Biking is fun, efficient (saves time & money) and the easiest way of getting around Amsterdam - just like the locals do! With nearly a million cycles running around (yes, on a typical day, bikes account for more than 50% of traffic in Amsterdam), it may be quite challenging and you must pay attention to the traffic rules. Please don’t try to copy the cycling style/speed of locals, they’ve been biking there since they were 3 years old, you can’t match their skills😊. As I mentioned above, the Amsterdam is filled with bikers and walking tourists; which makes it difficult to drive at the city center (especially for the newcomers/visitors). If you’re coming to Amsterdam by car, it is always wise to use parking garages or Park & Ride (P+R) facilities available outside the City Centre. Believe me, this will give you peace of mind (from the stress of driving within the city) and perhaps may save you from some “heavy” traffic fines as well. P+R facilities are cheaper (or sometimes free) and will always have a good connection to the metro/train network. Tip#6: Coffeeshops and cafés are NOT the same! Here comes the interesting part. A friend of mine recalled his Amsterdam memories on, how he ‘accidentally’ visited a coffee shop (just like how he ‘innocently’ sprawled into the Red light district😉). If you don’t want to (or may want to?) make the same mistake, then you must know the difference between the Coffeeshops and cafés. A coffee shop is a place where you can legally buy soft drugs (marijuana, hashish, space cakes,..etc) as well as regular coffee/tea /snacks (but none goes there for regular coffee/juice). A cafe is the actual coffee bar/ café/ Coffee House that sells regular coffee, tea, snacks and some with beer/ soft liqueurs too. You can take photographs of the canals and bars around, but never try to focus the ladies behind the windows. It is an offense to film them and your cameras are sure to be thrown into the canals at least (if not you’re in the police custody already). From Cheese, Chocolates, drops,… to stroopwafels (syrup wafers) almost all the famous Dutch products can be taken back to your home. But tulip bulbs are always a bit tricky! , You need to be sure about your home country’s import/customs law. Countries like U.S and Canada allow the tulips but under very strict conditions. You need to buy the bulbs from authorized sellers, who can give you a “phytosanitary certificate” - which confirms that the healthiness of the bulbs (regulated by the government of the Netherlands). It's always a safe choice to buy from the airport, they know the regulations well. My workplace is close to the Anne Frank house, but have never seen a single day without a crowd in front of it. Not just Anne Frank house, places like Van Gogh Museum and Madame Tussauds are always with miles long queues. Be smart enough to buy the tickets online, which mostly give you the fast-track entrance for free. Otherwise also fixing a time-slot for the entrance will save you all the unnecessary waiting times. Of course, Amsterdam has so much to keep you engaged. But at one stage, if you feel that you’re done with those old buildings and canals😉, you must visit the charming neighborhood. Personally, I like the neighborhood very much than the city itself. Zaanse Schans (beautiful village with majestic windmills and clog factories), Harlem (one of the oldest cities of the Netherlands), Keukenhof (the world famous tulips fields & garden), momentous towns like Volendam, are all well within 30-60 minutes from the Amsterdam city, with a perfect public transport connection. To truly experience the real-Amsterdam, you must visit them, you’ll be amazed! "just feel free to ignore everything I've said above so far😊". Sometimes it is fun NOT to make any plan/preparation. Just wander the city with all that Amsterdam has to offer. Just go-on-the flow and take whatever good and bad😉 you encounter! I'd still love to hear your thoughts/questions/ advice in the comments section below. Will you?. Toys, electronics, lamps, footwear, holiday decorations and increasingly, furniture and clothing are consumer areas that are almost completely Chinese dominated. Even when something is tagged as "made in America" it is quite likely that it is made up of Chinese components or comes in Chinese packaging. A lot of people think that China makes only shoddy and cheap things, but, no, there are a lot of increasingly high-end products coming from there, including Barbie-shaped chocolates and even wedding dresses! Broken appliances are liable to gather dust because the spare parts are all Chinese made. Even celebrating the Fourth of July - with its fireworks, flags etc. - was next to impossible without Chinese made goods. 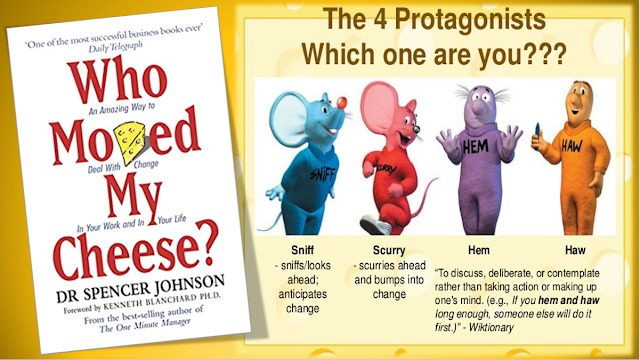 The book is entertaining and reads at a fast pace. 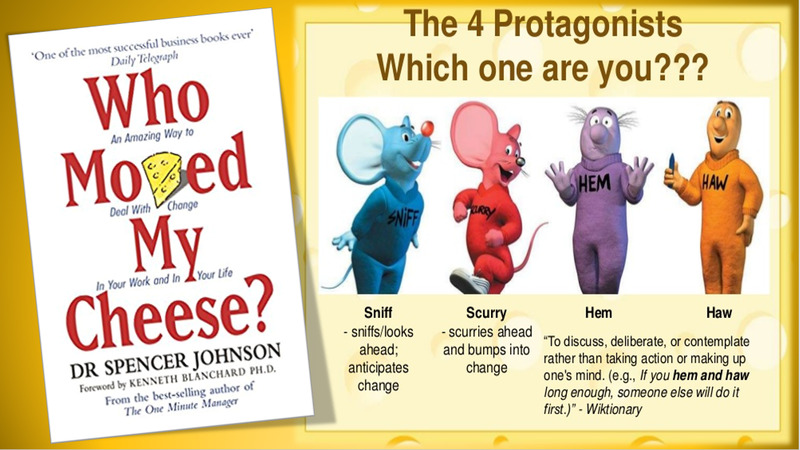 The author livens it up with hilarious anecdotes, conversations, and mini-lessons in global economy and creativity. She's funny, outspoken and when she becomes frustrated with the complexity of her task, which happens a lot, you get frustrated along with her. Moreover, Bongiorni is a journalist, so it comes as no surprise that her writing style is enjoyable, humorous, and easy to read. You also automatically come along the way realizing that going without Chinese goods is a herculean task...are you up to the challenge? While reading this book, I would often pause and take inventory of my home and see how much of what I own does come from China. It sounds like a fun experiment, although I doubt I would be able to last an entire year. I applaud Bongiorni and her family’s accomplishments with their test, particularly the kids who put up with an entire year of fewer toys and reasonable, but not ideal, alternative to their Wishlist. I think this is a book that most people could benefit from, but not everyone will want to reenact. So, I guess the question is: are you worried about China taking over your homes and if you are, are you prepared to do something to stop it if you think it can be stopped? Let me know what you think.